You’re right, what you say is consistent with the rest of the shortcuts. But I also like a more comfortable way to activate this option because I think it can be very used. I would like to have the move up/down and left/right especially for grease pencil workflows. This is feedback from me and my colleague on what shortcuts we realy miss. It doesn’t need to be (ctrl + shift + alt + c) just make a shortcut. Alt+mouse-wheel scrolling for frames offesting is not brought back,i ported mine from 2.79…it’s really an awesome one…it should be a default shortcut. What I find confusing is that while 2.8 moved in the correct direction for the selection modes, from Ctrl+Tab + Click to just a single button press for each mode, it has done the opposite for toggling wireframe and for pivot points. 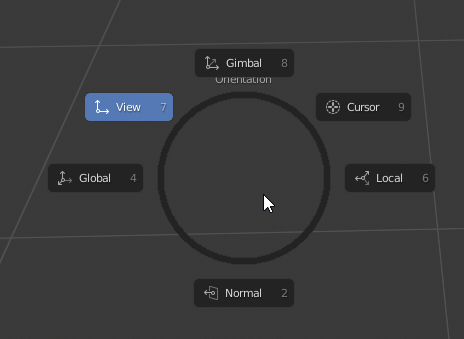 The radial menus are much more tedious and time-consuming to use, especially considering that 90% of the time you only want the same two options. You want solid or wireframe on Z, and you want 3D cursor or bounding box/median on period. Obviously people can set up these configurations for themselves. but I worry a lot about the impression Blender 2.8 will give totally new users, because it’s less easy to use efficiently when you’re actually trying to work than 2.79. Actually pie menus can be much faster, because you can use muscle memory in a gesture to activate something. It also means that we can provide quicker access to more commands, because one key (say, comma) now gives quick gestural access to many commands. Just using comma and period gives shortcut access to all the pivot point and transform orientations right there. You only need to learn and remember two shortcuts to do all these things, vs dozens of of separate shortcuts that most users are not likely to remember, and for which there isn’t space on the keyboard for regardless. It may be theoretically faster if people actually used all of those options with equal frequency, but, 90% of the time I’m only toggling between two things in these pie menus, and hitting one key is faster than hitting one key, flicking the mouse, and clicking. And if I’m keyboard modeling, I also have to reach for the mouse first. And if I need the pie menus, I just do Shift + Z, which I do maybe once every hour as opposed to every other minute. You actually don’t need to even click. That’s why it’s so fast. We should include some sort of tutorial to teach users this. Ah yes, that does rather improve it, and isn’t immediately self evident. will this behave appear in context menus as well? click-flick-release. I think Pablo mentioned that some time ago. For now is not there. Would be handy for wacom tablet users. I think that would be good to add, yes. In fact current behaviour is almost like a bug. If you click, drag, release on a normal menu in the header, it does work. Just not when you right-click, drag, release using contextual menu. Idk if I forgot the shourcut or what but I remember with some modifier key the orbiting gizmo on the upper right corner did snap to ortographic views AND to places in between like the cube on max does. Was it taken out? I noticed now when hovering over the spheres each one has it’s own shorcut displayed. Thanks, it worked! I noticed it works if you press alt after starting to orbit but not before, it could be added to the tooltip, it forced me to try bot ways instead of thinking I was using the wrong key. Can we move (assign) shortcut of Transform Orientation from " , " to something free like " alt + space?". Many people I know (and me) switch orientations especially after “Orientation from selection”. Which also needs some love in this matter. I have question. How i can make left click select acting like if choose 2.7x shortcuts at fresh start of 2.8? I cant use 2.7x shortcuts because some of them not working. What the difference between left click and right click. Are they just swapping buttons and changing the W menu? Can we have also different transform orientations for rotation and for location and for scale? Also can we have “parent space” transforms?